Did I dream? I don't think so. It's all random. I kind of felt like I dreamed about my ex-boyfriend. And my former best friend. And Jason from General Hospital. But who wouldn't want to dream about him, right? I think that wasn't part of my dreams until I came home. But forgive me, I forgot to tell you where I was. I did a sleep study last night. I was hooked up to all these fun wires as I snore like a banshee, if banshees snore, that is. And I spoke to my doctor about it and so that was that. She said I could do this, or go to an ENT, of course when I got there last night the woman asked if I had a cold and I told her about my perpetual stuffy-ness and she thought I should go see an ENT. I don't know. And what stinks, aside from her tearing that tape and those "things" off my head and face in a raw-ing fashion, (sorry - I paused as I was typing so quickly I had a typo or two, not a part of the rules, but shoud really bothered me! ), and is that I left this AM and she couldn't tell me much of anything. Ah,w ell. Wonderful. The child is watching Max and Ruby (she is quite the b!tch - isn't she? Poor random Max. Sigh.) right now while eating the identical lunch to my own. I was so ready to enjoy mine and there she was, deciding she wanted a thin bread (flatbread? those round pepperidge farm circles. you know the kind, right?) and turkey slices, with american cheese and avocado, too. I know, it sounds good, you want some right now, also, and who can blame her? Not me. was ready to offer, until she wanted MINE. Argh. Kiddo, go make your own. I mean, seriously, you're four. You can use the sharp knife for the avocado, can't you? I kid - I kid. I made her one, too. But does anyone else just want the one you make for yourself and does it make you selfish or a touch of OCD to think, well, I'll make her a different one as this one is MINE. I don't think I went over the time limit, and I'm not even sure if I reached it, but my child just said: "More, more, please please!" so she is obviously starving and in need of a second sandwich. Heck, maybe I am, too. When food is good, it's good, right? 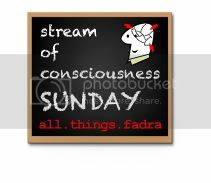 Hope you're joining Fadra today for Stream of Consciousness Sunday. If you don't know what that means, click the button below! Max really needs time with other children. Rudy is so bossy! That sandwhich sounds so yummy! Can I come over and make one for myself? Ruby is bossy. And annoying. Man, I feel for Max too. My favorite book to rad my son right now is the one where Max heads to Grandmas to have ice cream for breakfast.